Are you setting business priorities to focus on what matters most? As business development strategists, our goal is all about aligning each individual’s values and talents with the work they do so that they can make the positive impact they were meant to make. Many times, people embark on a career only to find that they are not comfortable in the job or don’t have the skills to be successful. On the flip side, entrepreneurs often embark on building a business based on their passion. When building a business that embraces a passion, the same questions need to be answered in order to make the business sustainable and profitable. Establishing long-term success requires solid planning, strategy and execution. What do you & your business stand for? As you start and develop a business enterprise, there are three questions to answer and revisit on an annual basis. We have a changing work environment, so adjusting to these changes keeps you moving toward your long-term organizational vision. These three questions become important indicators that you can make the positive impact on society that you have been equipped to provide. Whom do you serve? Clearly identify the customers and community members who benefit from your services and products. Know the issues that these individuals care about. They are more likely to support your business if they know that you are aligned with these same issues. For example, if your customers are concerned about the environment, offering eco-friendly products or donating to environmental support organizations becomes an important connector to them. What are the numbers telling you? If you don’t keep track of your financial statements, you will not be able to carefully monitor whether you are making a profit. Maybe you want to provide services to individuals who can’t afford them unless you offer rock-bottom pricing. However, by letting the numbers be your guide, you may be able to provide a higher level of services that allows a profit margin great enough that you can afford to provide free or lower cost services to the group who otherwise could not afford you. What is the message you want your business to convey in the marketplace? How you treat your employees, and how you collaborate with the community in which you work sends a clear message of the values that you hold. The message also is conveyed through the business priorities that you set. Business growth is always a goal for leaders. Setting business priorities that establish a sequence for moving toward and attaining the goals set and the long-range vision is always a solid, effective business practice. But what does this look like? Establishing business priorities is always grounded by the business purpose. Why are you in business and what do you expect this business to accomplish? This is the long-range impact you expect this business to produce. Annually set goals to ensure business growth based on the answers from the three questions above. From those goals you identify the jobs to be completed by whom and by when. This becomes your road map for the company. 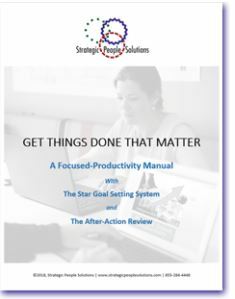 We suggest you consider investing in our do-it-yourself-manual, GET THINGS DONE THAT MATTER. This manual is a necessity for your business growth. The priority-setting and productivity system is clearly formatted in a step-by-step process. Effective business priority setting requires you to be able to distinguish between what is urgent and what is important. You must do what is important first and address the urgent second. When setting your business priorities, you also will be required to say “no” to things that don’t help you reach your long-term vision. When your business priorities are aligned with your values and are a manifestation of your talents, you will find that, even on the worst of days, maintaining these priorities will not be difficult. Download Setting Business Priorities as a pdf.